Frederick Taylor had a shop in the Borough from around 1913, although there are no advertisements in any of the local directories and only sparse advertisements in the local press. 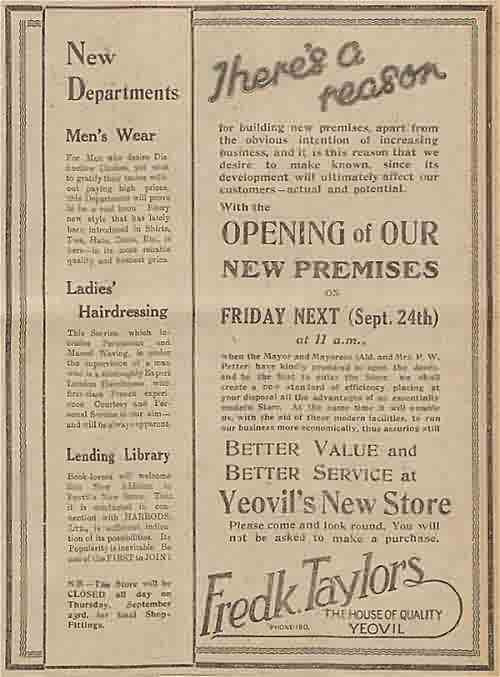 It is thought that Frederick Taylor's was a small multi-store company and that Yeovil simply had one of several outlets. The location of the store in the Borough is unknown, but may have been on the site of the later store. 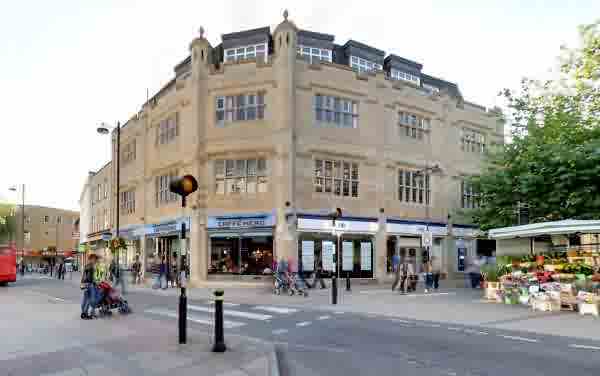 This later store, one of Yeovil's earlier department stores, was built built on a steel frame in 1926 on the corner of High Street and the newly-built King George Street. 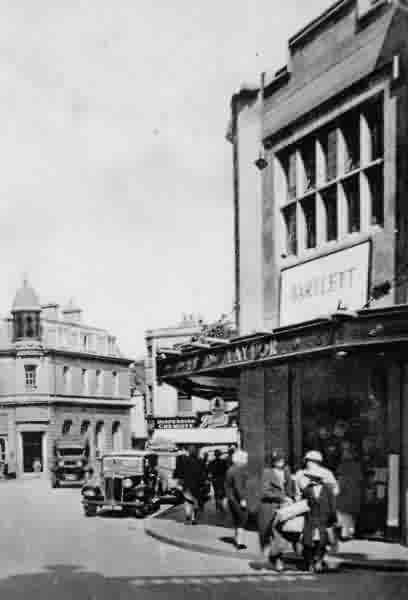 The new store was opened by Mayor Percival Petter on 24 September 1926 - some two years before the new municipal offices opened on the other side of King George Street. 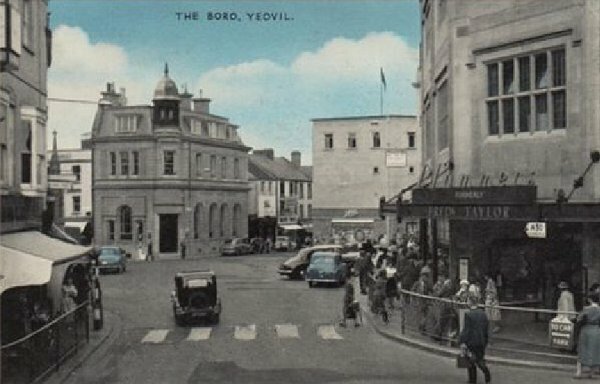 In 1936 a new, second floor was added to the building by the Yeovil-based building firm Bartlett's. Frederick Taylor's remained in the building until the late 1940s and, certainly by 1950, they were followed by Plummer's. Plummer Roddis Ltd started out as separate companies in the nineteenth century. William Plummer was a draper in Hastings in 1871 before opening another store in Southampton. George Roddis was listed in 1870 as a draper in Market Harborough, but by 1881 was a partner in a drapers & milliners called Roddis & Goldsmith in Hastings. In the late nineteenth century William Plummer, George Roddis and Reginald Tyrrell, a Bournemouth draper, joined forces to create Plummer, Roddis and Tyrrell but in 1898 Reginald Tyrrell left partnership to concentrate on his other business interests and the business became Plummer Roddis. The business continued to grow opening branches in Boscombe, Brighton, Bath, Eastbourne, Folkestone, Andover, Weymouth and Yeovil. In the early 1970s the stores were rebranded as Debenhams. During the early 1960s yet another storey was added to the building, this time set within a Mansard roof, making a total of four floors. Following the departure of Plummer's, the store was occupied by several shops, including Harris' furniture outlet in the 1980s. More recently the premises have been divided; that part facing High Street has been occupied for a number of years by Caffè Nero. 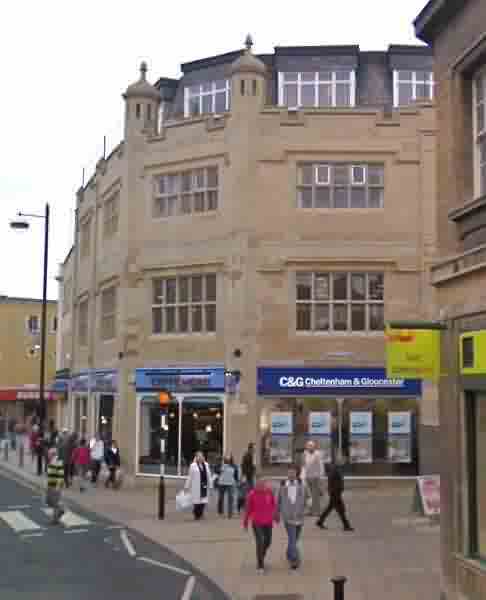 The portion facing King George Street was occupied by Cheltenham & Gloucester Building Society but is now occupied by the TSB. 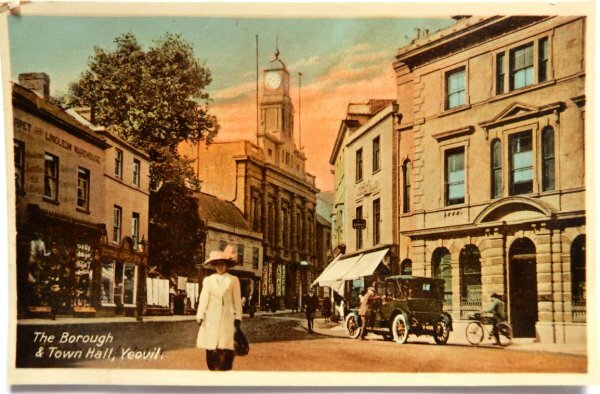 A hand-coloured postcard showing the Town Hall as seen from the Borough around 1918. Frederick Taylor's early store my have been in one or both of the shops at left. Certainly the new store would replace these two buildings in 1926. 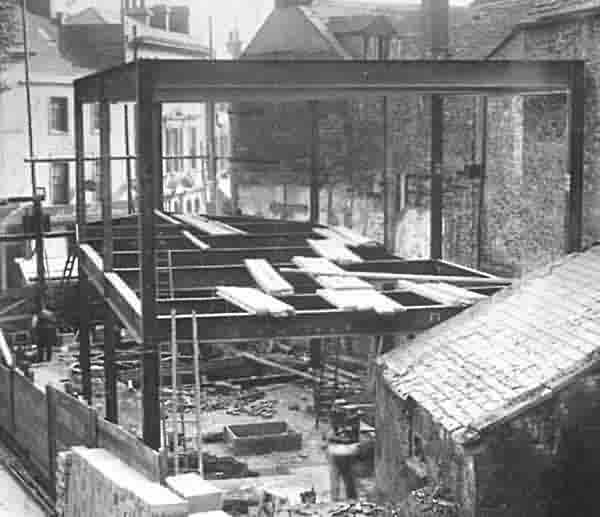 The new store building under construction in early 1926 on the corner of High Street and King George Street. 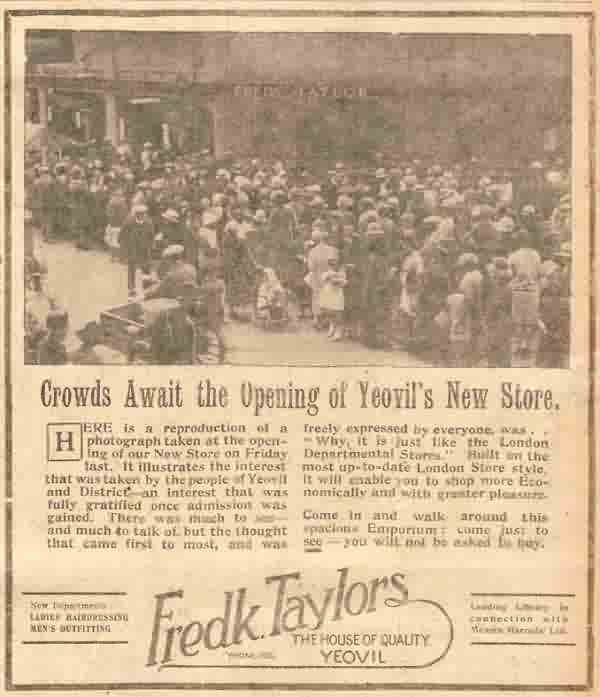 A whole-page advertisement taken in the 17 September 1926 edition of the Western Gazette for the opening of the new store. A report on the grand store opening and a photograph of the crowds that attended. The newly-opened store, photographed in the late 1920s. A view of the Borough, including the new Frederick Taylor store, in a postcard of 1932. 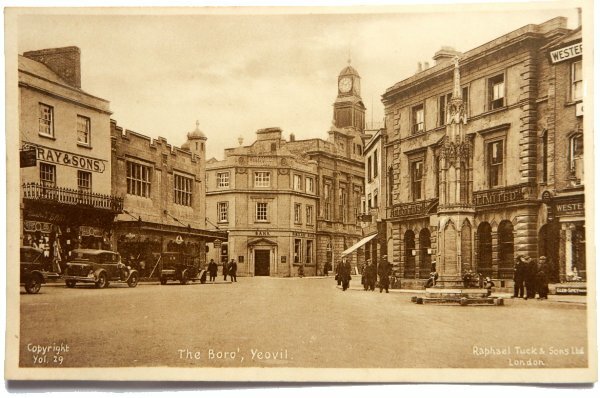 The Town Hall (with the clock tower) would burn down in 1935. 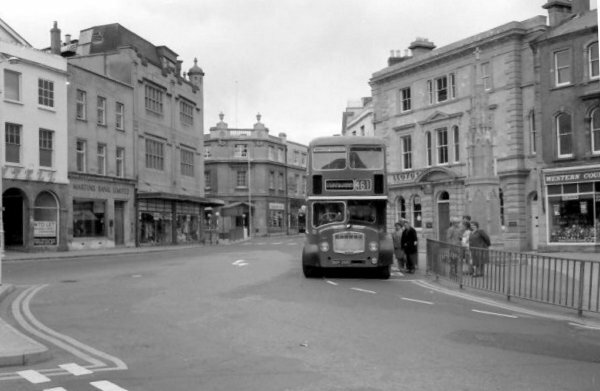 .... and seen from High Street around the same time (the Town Hall is still present). 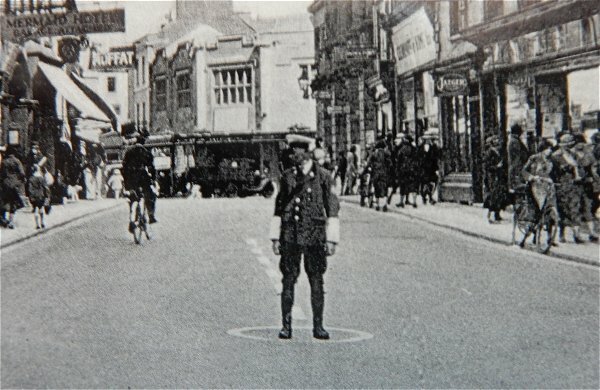 Note the AA, RAC or policeman's traffic duty circular marking at the junction of High Street and Hendford. 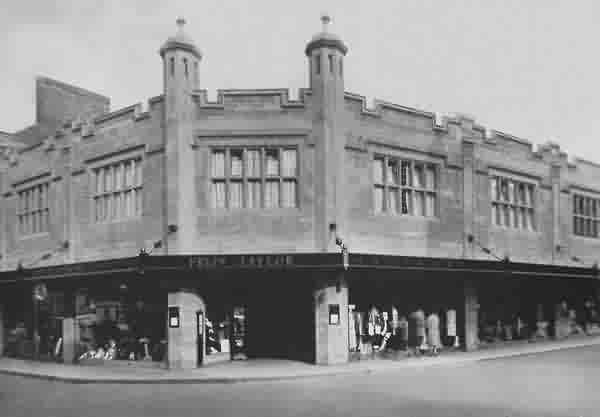 Photographed in 1936 as Bartlett's, the building firm, was about to start adding the third floor. 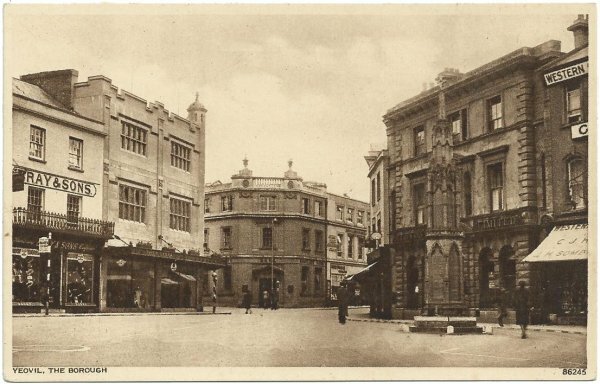 In an almost identical postcard, dating to after 1935 (the town hall has disappeared), Frederick Taylor's store is now three storeys high. 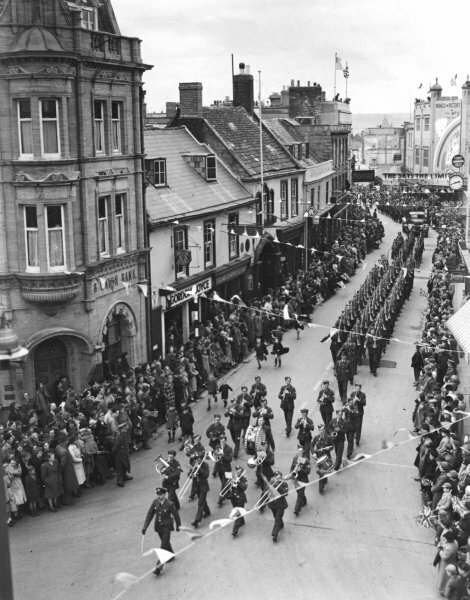 The 'Wings for Victory' parade marches along High Street in May 1943. Frederick Taylor's building, seen at top right, sports a large display (see next photo) of the amount collected at the time. At the time of the parade, the people of Yeovil had raised £473,300 towards the 'Wings for Victory' campaign - enough for 94 Seafire aeroplanes. 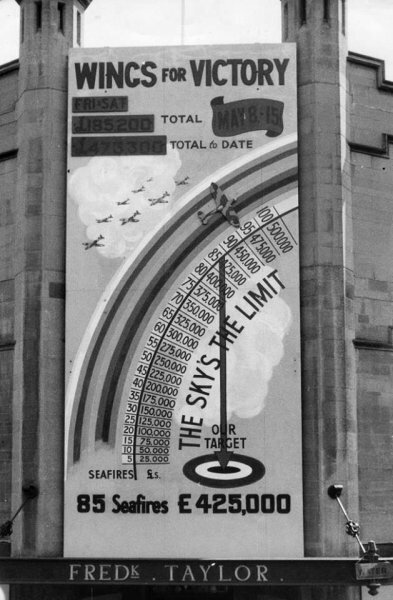 This large display was above the entrance to Frederick Taylor's store, on the corner of High Street and King George Street. 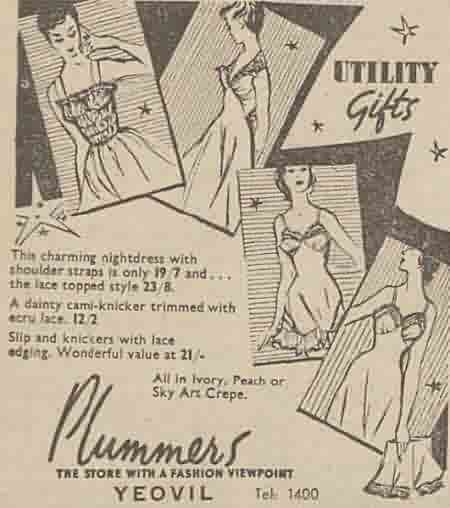 A Plummer's advertisement from 1950 - note the 'utility' gifts. 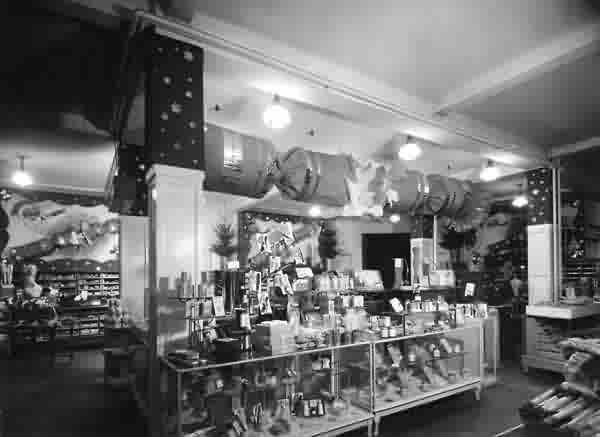 The Christmas display in Plummers, around 1950. A hand-tinted postcard of the Borough postmarked 1961. Note the former Frederick Taylor's store at right, on the corner of King George Street. Even after ten years or more it is still called "Plummer's formerly Frederick Taylor". The Borough photographed in the mid-1960's. It has changed very little since then. Note that Plummer's store is now three storeys high, with a fourth floor added in the new Mansard roof. 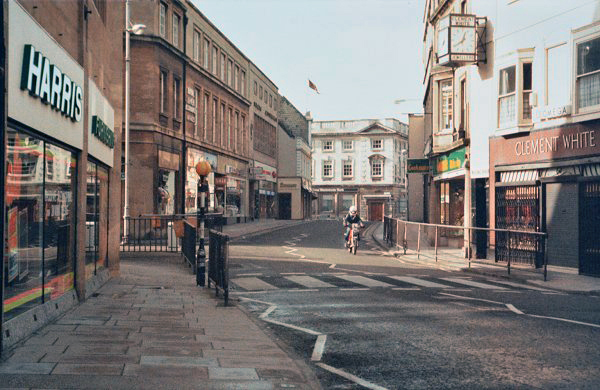 High Street, looking west, photographed in 1985. At this time the former Frederick Taylor's / Plummer's store was occupied by the Harris furniture store. The building photographed (by Google) in 2008. .... and again in 2017.